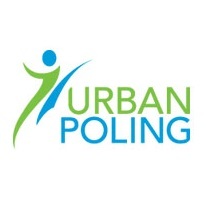 100 Years Young and still Urban Poling! Bea Husser will be celebrating her 100th birthday on September 30, 2017. She was born and raised on a farm just north of Ashmont, Alberta. She was introduced to Urban Pole walking by Alberta’s Master trainer, Susan Yackulic, when the Cloverdale Community league hosted some Try-It sessions about 4 years ago. 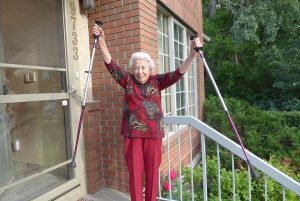 She continues to walk, with her Activator Poles, about 4 – 5 times per week. The poles provide her with the ability to walk independently even though she has lost most of her sight and is hard of hearing. Bea loves the fact that her ACTIVATOR poles provide her with the ability to be outside exercising on her own, which is so important to her! Having grown up on the farm she led an active lifestyle raising horses, chores and regular camping trips with her family. Her father, who was a nature lover, enjoyed walking everywhere and lived to a healthy age of 95. He instilled in Bea a love for the outdoors and active living. When asked what her secret to having such good health and longevity, Bea replied; “There is NO secret”, she continued “Good genes and moderation in most things.” She definitely came from a family with good genes as can be attested to by both her parents living in to their 90’s and her Norwegian grandmother lived to 85. In terms of advice that she would pass on to younger people she would encourage people to look on the positive side of things. Strive to look for the beauty in all things. She states that it is important to have a positive and upbeat attitude! Wise words from a healthy, fit and fabulous centenarian! HAPPY BIRTHDAY BEA! What a fabulous role model you are to wrap up ACTIVE AGING WEEK!